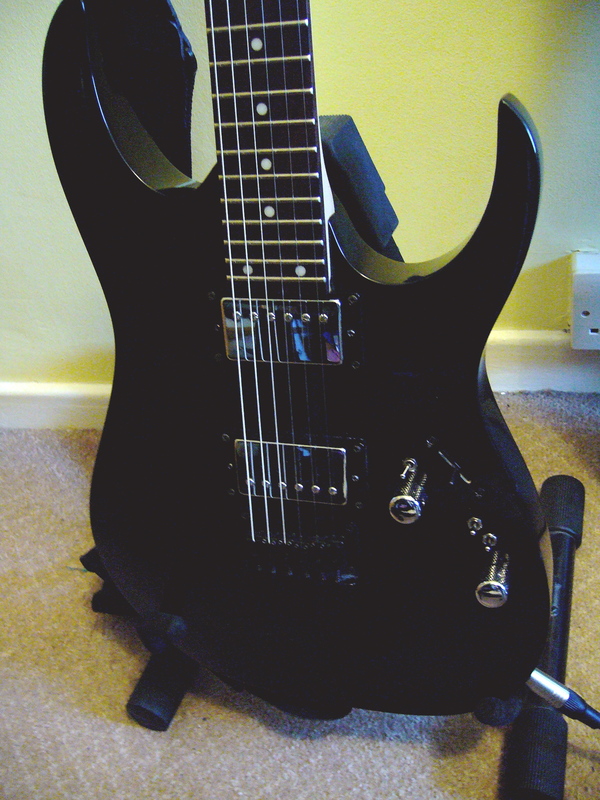 This article follows on from my previous post, discussing modifications to my Ibanez GRGR121EX, “Tess”. Recordings were made before and shortly after the new pickups were installed. The set of strings is the same (Rotosound pinks), as the new locking tuners made it fairly easy to detach and re-attach the strings as needed. However, the A-string broke and had to be replaced with a spare from a set of Ernie Ball Regular Slinky. This is a higher gauge so may have some influence on the recorded output of the new pickups in this range. However, I did not notice any dramatic change following the next re-stringing (more Roto-pinks). Many of the branded products referred to here are trademarked. I am not affiliated with any of the companies involved, and make direct reference to their products in the interest of accuracy and repeatability. Even where the criteria are quite clear, it can be difficult to piece together the information you really need. Items such as guitars can be tried out in a store; but even then you are using an unfamiliar amplifier. For items such as recording interfaces demos are rarely available. Virtually all of my MIDI equipment has been purchased largely based on their user manuals; the free PDF user manual is a godsend for a synth geek trying to construct a flexible clock-synchronisable program-changeable remotely-controllable live rig. Whether it will sound any good is completely unpredictable. A guitar pickup is not a terribly complicated device. However, there are many conflicting approaches to making the best pickups. Hand wound or machine wound? Scatter winding? More powerful magnets for high output with less noise? Weaker magnets for less string pull? I will not go into a detailed discussion of the different types of pickup here, as it has been done elsewhere many times, but it is difficult to avoid a little cynicism. Why do some pickups cost so much more than others, when the construction should be identical? I decided on the Irongear Hot Slags for my project (see previous post): the reviews were good from a range of websites, and they seemed to offer a “modern” sound with some character. I was particularly intrigued by a helpful graph, promising a hot, mids-heavy sound. My stock Ibanez pickups have the styling of EMGs, but this says nothing about their sound. It is unlikely that they give the “flat” sound that EMG’s active range are famous for. All recording was done into Logic Pro 8 at 24 bit 44.1kHz, using the direct guitar input of an Edirol UA-4FX interface. 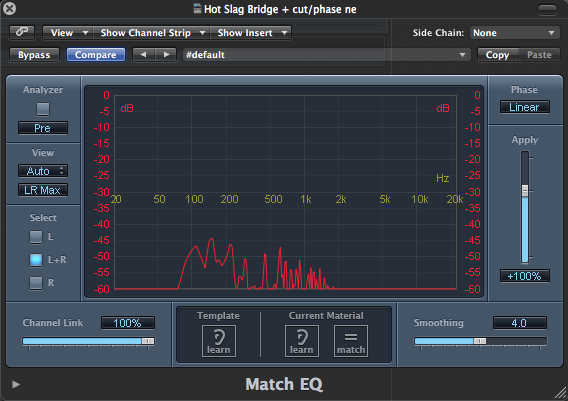 The Match EQ is an inbuilt effect used for calibration. I used the calibration mode to produce a graphic representation of the material it is exposed to. For each pickup configuration I played a simplified version of the guitar part for a song called “No More Days”. This is a song I originally wrote for a band at University, and has subsequently been adopted and adapted by one of my other bands, Broken Console. The studio recording is free to download. Examining the curves generated by the factory pickups: the bridge pickup gives a surprisingly flat response, while the neck pickup has a pronounced hump in the bass end. The small peaks and troughs may be disregarded as a consequence of the source material, which is all in one key and heavily favours some notes (and hence frequencies). The neck pickup may be expected to show a strong bass response as the string movement is greater at the neck pickup for low notes. High harmonics, on the other hand, dissipate quickly and are usually more prominent in the bridge position. 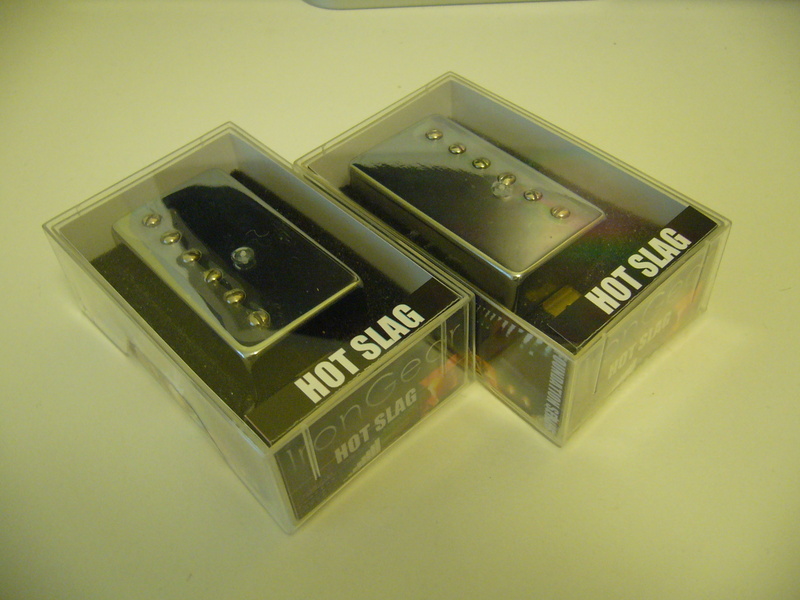 Examining the frequency response of the Hot Slags, the bridge response is surprising; it appears almost identical to that of the factory pickup. The overall level is around 2 db higher, which is an audible difference but not huge. The neck pickup displays a similar increase in output, but the bass frequencies are even more dominant. It is not practical to examine all of the coil-tapping and phase-flipping possibilities of “Tess” following modification. However, there is one combination I have been using a great deal, which merits inclusion. The pickup selector is in the middle position, the bridge pickup is set as a standard humbucker, the neck is coil-tapped and out of phase. This gives a very distinctive “hollow” sound. Tess' control panel. Just as bewildering on-stage as it is in this terrible diagram. It can be seen from the figure that the output drops substantially due to the phase cancellation, and a “gap” appears in the low-mid frequencies around 300 Hz. This gives a “scooped” sound which interacts well with high-gain amplifier settings. On paper, the frequency response of the new pickups is very similar to the frequency response of the factory pickups. The “character” of the guitar has not significantly changed. However, the new options open up a range of new sounds, and a higher output is available. This graphical examination has not addressed the subjective measure of “clarity”. It is claimed that high-quality pickups make it easier to distinguish the individual notes of chords, even with distortion. The source material is made available in compressed form below. I you would like a copy of the recordings in a lossless format, please get in touch. While the Match EQ is very convenient, I would prefer to use something a little more rigorous, and capable of returning a numerical output. It’s possible that my dabblings in programming will arm me to write something appropriate. If you know of a suitable existing tool, preferably FOSS, please let me know! Playing back a piece is difficult to do consistently, and far from ideal. One option for future tests would be to try to directly stimulate the pickup with an e-bow or a headphone earpiece playing pink noise. A more appealing option is to construct a consistent “guitar-plucking machine”, possibly using LEGO. Any designs or suggestions are welcome. Further experimentation is needed to confirm the claim that some pickups are “clearer” and “more dynamic” than others. As a post-exam treat, I set about upgrading one of my guitars. My inner artist wanted something inspiring with more options. My inner perfectionist wanted higher quality and better technology. My inner poseur wanted something that looked “custom” but tasteful. 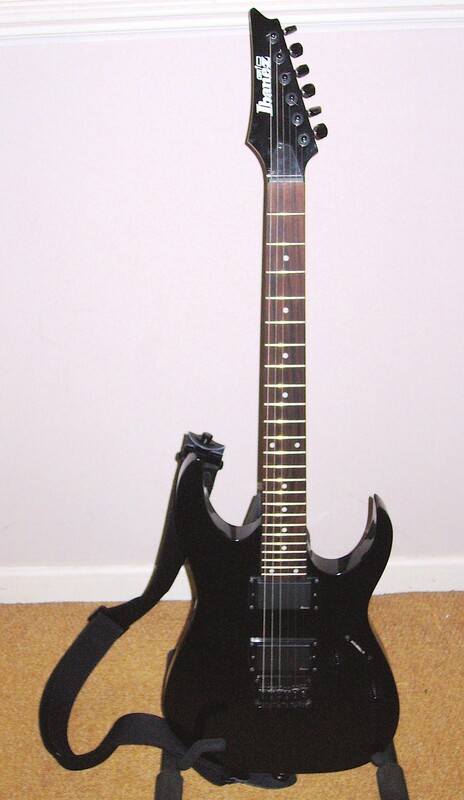 Complete with EMG-style stock pickups and all-black hardware. The strap buttons have already been replaced with a locking system. Tuning stability was not great on this guitar. In fairness, my reference point is my other electric guitar, which is made out of resin and so not susceptible to temperature or moisture. Nonetheless, I felt there was definitely room for improvement on the tuning system. I’ve been interested in locking tuners for a while, and also fancied a change from all-black hardware to a mixture of black and chrome. The guitar has a reverse headstock, however, which greatly limits the choice of affordable locking tuners. 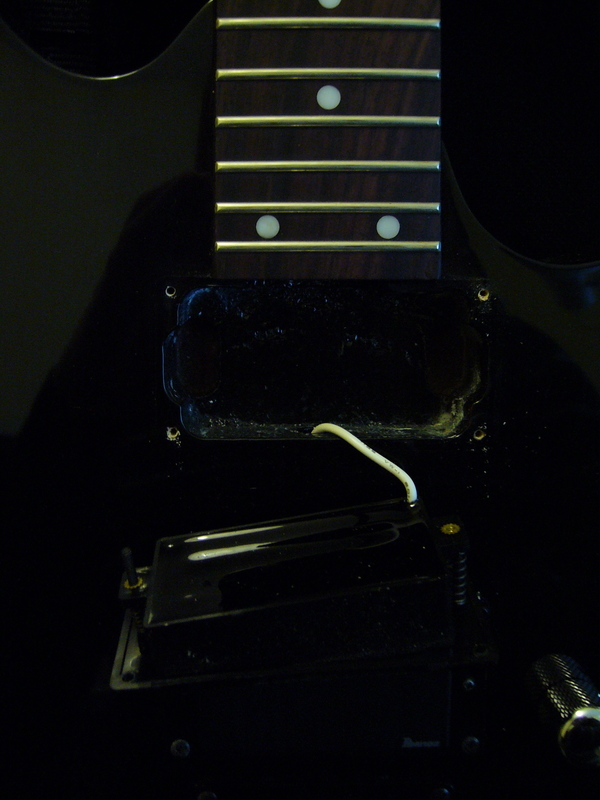 This is one of the less obvious drawbacks to a reverse headstock; you need left-handed hardware! (Or, if you prefer, this is a point in favour of reverse-headstock left-handed guitars.) In the end I got them from axetec, along with the other parts used in this project. 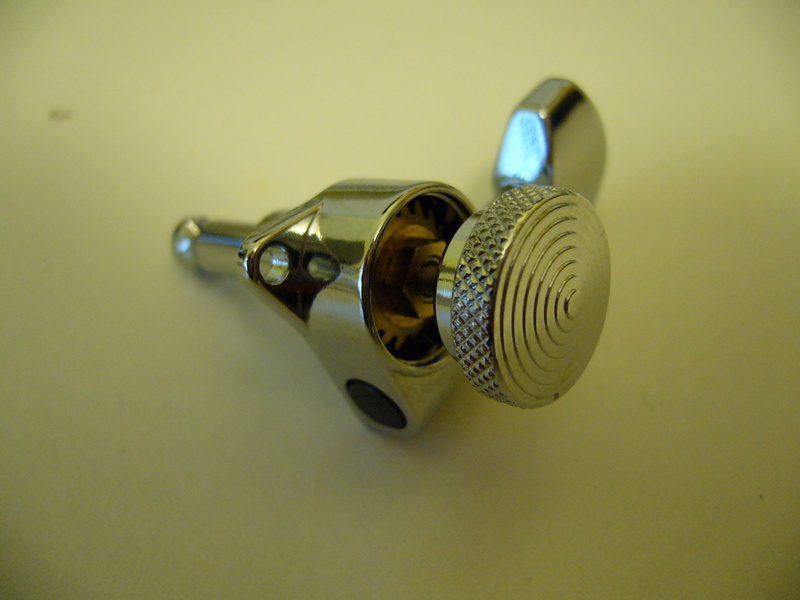 Locking tuners are beautifully simple in use. Simply pull the string through the hole, tighten up, and cut off the excess. Less winding means less slipping and stretching, as well as saving you a minute or so every time you change strings. If you loosen the thumbwheel enough, it is possible to see the gearing in this system. As the thumb-wheel is tightened, a rod pinches the string in the hole to prevent slipping. The excess can be cut off close to the hole. 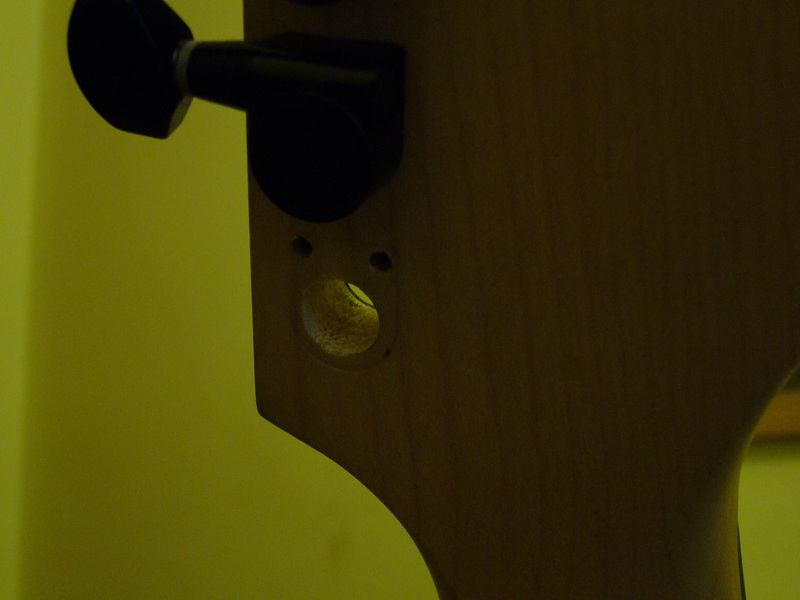 The factory tuners don’t have a visible screwhole; in fact they are built with two studs on the underside which sit into corresponding holes in the guitar headstock. This is quite an elegant design, and also meant that while I had to drill new holes, the old holes would at least be hidden by the new machine heads. 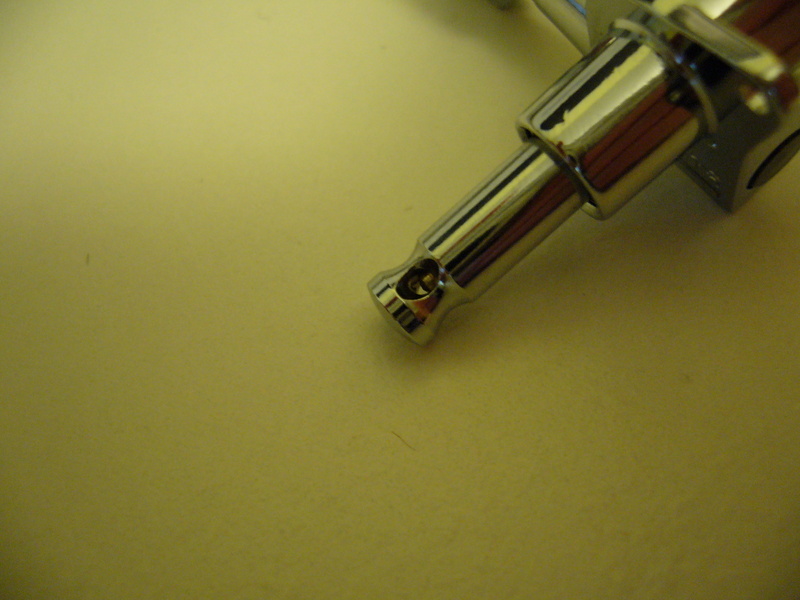 The factory tuners are relatively compact, and interface with two small holes to prevent twisting. These are completely covered by third-party tuners. Drilling the holes for the new screws was a little intimidating, as the screws extended into about ¾ of the total head thickness. I used a hand drill with a 2mm bit. Thankfully the actual holes and washers for the tuners were all a standard size, so there was no difficulty threading the new tuners through. The original knobs are made of black plastic and feel cheap. I could also feel some drag when turning them, and procured new potentiometers, assuming that these were faulty. However, while fitting the new, shiny and reassuringly heavy telecaster-style knobs, I discovered the real problem; if the knobs float just above the body, they move easily. If they are set at an angle, or too close to the surface, they drag. So, if you’re finding odd resistance from your control knobs, get a screwdriver out and try mounting them 1mm higher. It may save you a few quid on new electronics you don’t need! I must confess to some skepticism regarding pickups. It is difficult to understand why there is such a variety in the pricing of such a well-established and simple product. There really can’t be that much difference between the magnets and copper wire used in a £5 ebay pickup or Seymour Duncan’s finest, can there? Obviously the design is significant, and it is uncontroversial that pickup choice is one of the most significant factors determining a guitar’s tone, along with amplifier and playing technique. Still, I fancied something with a modern meaty sound, and some flexibility. I settled on a pair of Irongear Hot Slags with chrome covers. Definitely moving away a little from standard Ibanez territory here. The factory pickups these are replacing are in a matt black casing evocative of EMG pickups, and strongly implying that they are active. 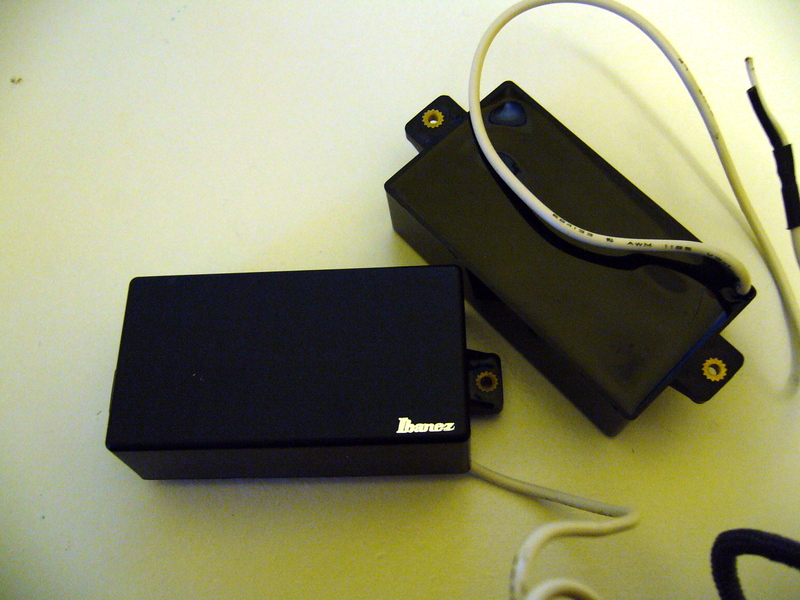 In fact, these are simple passive pickups, set in a black resin which would have made rewiring the coils difficult. Unfortunately, they are also slightly smaller than the Irongears, and a buildup of resin around the base of the guitar neck resisted the insertion of a shiny replacement. After a little filing there was a sickening “CRACK” and small piece of resin came away, exposing more of the neck pocket. Once I’d started breathing again, I remembered that the neck is in fact held in place by four massive bolts, not a layer of resin, and that this was probably nothing to worry about. This created the needed space, and the guitar’s chrome content was increased accordingly. 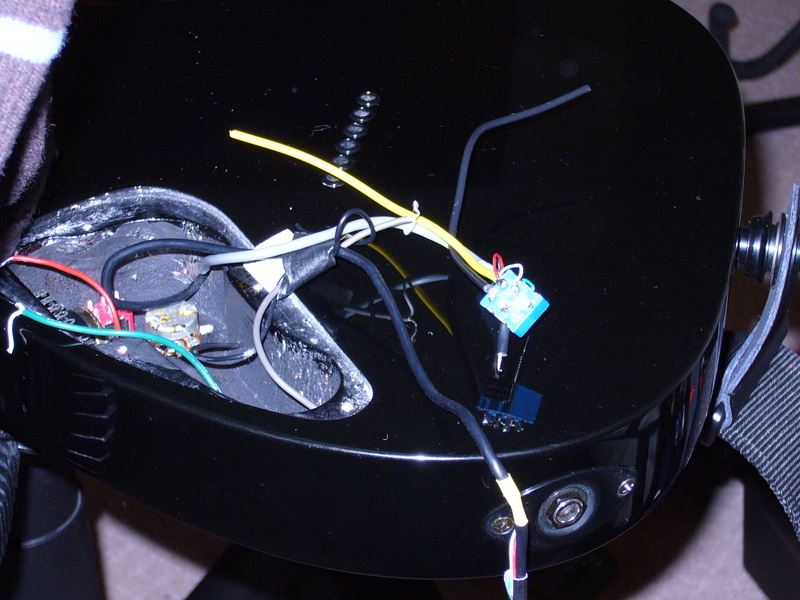 As is common for “upgrade” pickups, the Hot Slags provide separate access to each end of wire for each coil, as well as the cover grounding. This opened the way for some ambitious wiring schemes. I based the wiring on this design from the very helpful guitarelectronics.com, with an additional phase flip switch between the neck pickup coil selector and the main 3-way pickup selector switch. One note for those who wish to try this for themselves; I also had to swap the left and right sides of the coil-selector lugs to match the wiring on my own 3-way switch. Also, not all 3-way switches will work. 1728.com offers a fairly clear explanation of different kinds of switches and their use in guitar wiring. Fiddly stuff this wiring. Horribly out of practice at soldering. The most hair-raising part of the whole process was in fact drilling holes for the new switches. The guitar finish is fairly brittle, and drilling risked cracking and splintering the surrounding finish. For each new switch, I drilled a 3mm pilot hole from the inside of the cavity (to make sure there was room for the switch! ), then, working from the face, removed more material with 4mm and 5mm drill bits. This would lead to 1-2mm of damage to the surrounding finish (if I was careful! ), and from there I used a file to enlarge the hole to accept the switch. Unfortunately the switches are barely long enough to reach through the body; I intend to rectify this by removing a few mm of material from the inside with a pillar drill and large bit when I next have access to them. Still, the final result is neat and distinctive! 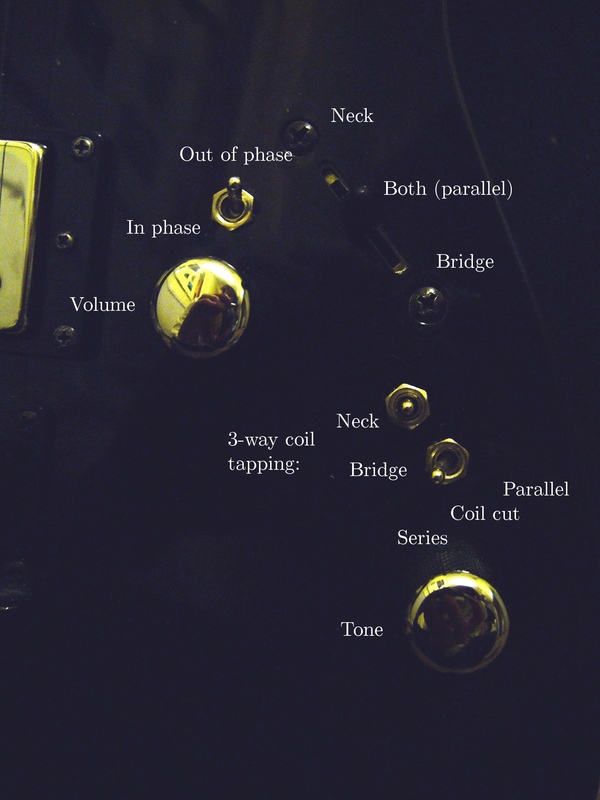 The top-most switch controls the phase of the neck pickup. The pair of switches above the tone knob switch each pickup between series, parallel and single-coil configurations. I’d like to analyse the actual differences this has made. It’s very difficult to choose pickups online, or in a shop for that matter, because of the lack of a baseline comparison. Soundclips are nice, but they tell you more about who has the nicest amplifier than who has the best pickups. If you have any questions about this project, feel free to leave them as comments and I’ll try to get back to you soon! This site is still under construction. I’ve had a few ideas that I would like to put into the public domain. They relate to music technology and chemical engineering. Perhaps I will find some overlap… I greatly appreciate the range of help and information I have found scattered across the internet, and can hopefully provide some information or inspiration in return! I’ve chosen wordpress, among other reasons, because of its elegant music player. The plan is to experiment a little with the review style, using a lot of sound clips. The downside is that I don’t currently have access to everything. There should be more pretty pictures and sound soon. In the meantime have a merry Christmas! it will take more time, so I can’t promise they’ll be up for a little while!